This article is about the Indian actress Asin Thottumkal. For other uses, see Asin (disambiguation). 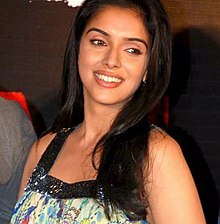 Asin Thottumkal (born 26 October 1985), known mononymously as Asin, is a former Indian actress who mostly appeared in Tamil , Hindi , Telugu and Malayalam films and a Bharathanatyam dancer. She has received three Filmfare Awards. She began her acting career in the South Indian film industry, but later shifted her focus to Bollywood. She speaks eight languages, and dubs her own films. She is the only Malayali actress, other than Padmini, to have dubbed in her own voice for all her films, irrespective of language. Asin has been referred to as the "Queen of Kollywood" by online portals in 2007. She is a member of the Bollywood 100 Crore Club. Making her acting debut with Sathyan Anthikkad's Malayalam film Narendran Makan Jayakanthan Vaka (2001), Asin had her first commercial success with the Telugu film Amma Nanna O Tamila Ammayi in 2003, and won a Filmfare Best Telugu Actress Award for the film. M. Kumaran S/O Mahalakshmi (2004) was her debut in Tamil and a huge success. She received her Filmfare Best Tamil Actress Award for her most noted critically acclaimed performance in her third Tamil film, Ghajini (2005). She then played the lead female roles in many successful films, the most notable being the action Sivakasi (2005), the dramatic thriller Varalaru (2006), the action thriller Pokkiri (2007), the romantic drama Vel (2008) and Dasavathaaram (2008), hence established herself as the leading actress of Tamil cinema and was also honoured by the Tamil Nadu government with the Kalaimamani award for her excellence in the field of art and literature. In 2013, Asin was conferred with the Pride of South Indian Cinema award at SIIMA for her contribution to Tamil cinema. In late 2008, Asin made her debut in the Bollywood film Ghajini (2008), opposite Aamir Khan, which was the first Bollywood film to have collected more than ₹1 billion in the domestic box office, subsequently collecting ₹1.9 billion (US$26 million) worldwide. Asin won the Filmfare Best Female Debut Award and many accolades for Ghajini. 2011 marked the most successful phase of Asin's Bollywood career, as she starred in Anees Bazmee's romantic comedy Ready, in which she co-starred alongside Salman Khan. The film was a major hit at the box office, collecting ₹1.84 billion (US$26 million) worldwide. In 2012, Asin first starred in Sajid Khan's multistarrer Housefull 2, which collected more than ₹1 billion. She then featured in Bol Bachchan and Khiladi 786, which were also commercially successful with both grossing over ₹1 billion. Asin was born in Kochi in Kerala in a Malayali Syro-Malabar Catholic family. Her father Joseph Thottumkal is an Ex-CBI officer and later managed several businesses. Her mother Seline Thottumkal, who moved from Kochi to Chennai and then to Mumbai to live with her daughter, is a surgeon. According to custom, Asin was to be named Mary, after her paternal grandmother. Asin's father however, named her Asin as the name had a beautiful meaning. Asin has quoted that her name means "pure and without blemish". She states that the 'A' in her name is from Sanskrit meaning "without", and "sin" from English. She attended Naval Public School from LKG through X standard. She then attended St. Teresa's School in Kochi for her Kerala Higher Secondary Examination Board (Plus Two) Education. After that, she attended St. Teresa's College in Kochi, a college affiliated with MG University, where she graduated with a Bachelor of Arts degree in English Literature. Asin's first assignment was an advertisement for BPL Mobile. She debuted in the Malayalam film Narendran Makan Jayakanthan Vaka in 2001, at the age of 15. After taking a year out to pursue her education, Asin returned with her breakthrough film as an actress, Amma Nanna O Tamila Ammayi opposite Ravi Teja, portraying a Tamil girl in her first Telugu language film, which subsequently fetched her the Telugu Filmfare Award for Best Actress. In the same year she won the Santosham Best Actress Award for her performance alongside Akkineni Nagarjuna in her second Telugu film Shivamani. Her following two Telugu films Lakshmi Narasimha and Gharshana, both portrayed Asin as the love interest for police officers and both were successful ventures. Asin's first Tamil language film was M. Kumaran S/O Mahalakshmi, in which she co-starred with Jayam Ravi. Asin reprised her role from her film Amma Nanna O Tamila Ammayi for the remake, which saw her portraying a Malayali girl instead of the Tamil girl in the original. The movie subsequently went on to super-hit in Tamil cinema during 2004, introducing Asin to Tamil film industry. After a brief return to Telugu films, to do Chakram, she appeared in Ullam Ketkumae. The film, initially launched in 2002, was supposed to be her debut as a lead heroine, is a college love story, directed by Jeeva, which was long-delayed but eventually became a successful venture at the box office, creating wider opportunities for her and the rest of the cast. After the release of Ullam Ketkumae, Asin was cited as a leading heroine of the Tamil film industry after starring in blockbuster films such as Ghajini, Sivakasi, Varalaru and Pokkiri respectively. The film which provided the breakthrough for Asin was Ghajini. The film, co-starring Surya, directed by A.R. Murugadoss, earned her the Tamil Filmfare Award for Best Actress. Her role was that of a vivacious young model named Kalpana. Sify.com praised her portrayal as "magical", describing her character as a "lovable chatterbox", played with "sheer ability in the romantic interludes, the poignant and heartfelt scenes when she rescues minor girls from villains and her gory end are touching". On the following Diwali in 2005, Asin had two releases, Sivakasi and Majaa. Despite the latter becoming an average grosser, the former went on to be a successful venture at the box office. The following year, her long-delayed venture Varalaru opposite Ajith Kumar also succeeded at the box office, and The Hindu said she "looks lustrous and sails through her role smoothly". Asin appeared in Pawan Kalyan's Annavaram, another successful venture, which was a remake of Thirupaachi. In January 2007, Asin appeared opposite Ajith Kumar and Vijay in two different films, Aalwar and Pokkiri, with the latter becoming a success, whilst Aalwar became a failure. Though Asin's role in Aalwar was criticised, her performance in Pokkiri was lauded by critics. Her final project of the year was opposite Surya, in Hari's Vel, which had a Diwali 2007 release, subsequently becoming her third successful film which released during the Diwali season in three years. Asin, who portrayed a TV anchor, was appreciated for her role in the film. Asin appeared in her first dual role in K. S. Ravikumar's Dasavathaaram opposite Kamal Haasan, who portrayed ten roles. The film had been under production since September 2006. Despite being overshadowed by Haasan's ten roles, Asin's portrayals in the film were praised as her "best-to-date", with one of her roles being that of a Vaishnavite in 12th century Tamil Nadu; whilst the other character was a Brahmin girl from Chidambaram, for which she won her first ITFA Best Actress Award. Dasavathaaram subsequently went on to become one of the blockbusters. Since establishing herself as the leading actress in South India, Asin opted to move into Bollywood. Her first film Ghajini, opposite Aamir Khan, was the remake of her breakthrough film of the same name. Upon release, the film garnered positive reactions from critics and masses alike, with Asin being singled out for her "fabulous" portrayal. Noted critic Taran Adarsh described her Hindi debut as "fabulous" and that "to share the screen space with an actor of the stature of Aamir Khan and yet remain in your memory even after the show has ended is no cakewalk. She looks fresh and photogenic and acts her part brilliantly, giving Asin's performance a positive outlook." Ghajini became the highest grossing Bollywood film of 2008 and the sixth highest-grossing Bollywood film of all time according to net collections. Asin later appeared in Vipul Shah's London Dreams, alongside Salman Khan and Ajay Devgn, in which she played a south Indian girl, Priya, who is emotional but strong willed and an ambitious dancer at the same time. The film received mixed reviews from critics. Her first film of 2011 was Kaavalan, which released on 15 January 2011. The film was a critical and commercial success. Behindwoods review of the film praised her performance: "Asin, in Tamil for the first time after Dasavatharam, convinces us with her portrayal. The chemistry of the lead pair has worked out well; especially the portions w things that ultimately result in love". The chemistry between Vijay and Asin worked out well and was appreciated. Asin went on to win the SIIMA Award for Best Actress for this film. The film also includes Vadivelu as the comedian along with Mithra Kurian, Roja and Rajkiran playing supporting roles. Her next movie with Salman Khan, Ready, was released on 3 June 2011 to mixed reviews. Critics praised the chemistry between Salman and Asin. Upon release, Ready became the second highest weekend grossing Bollywood film, after Dabangg and went on to become the fifth film in Bollywood history to cross the coveted ₹1 billion (US$14 million) mark in the domestic market. In 2012, she first appeared alongside Akshay Kumar in Sajid Khan's multistarrer comedy Housefull 2. Though it received a mixed critical reception, it was a major commercial success. Asin generally received favourable reviews for her performance, with Adarsh stating that "[a]mongst the female leads, Asin has the meatiest role and gives a decent account of herself." On 6 July 2012, Rohit Shetty's Bol Bachchan, alongside Ajay Devgn and Abhishek Bachchan, released with mixed reviews with the critics praising the performances of Asin, Ajay Devgn and Abhishek Bachchan. Taran Adarsh from Bollywood Hungama, who praised Asin's performance stated: "Asin does well, though her screen time is limited. Nonetheless, her amiable looks and stimulating smile add to her charisma!!." While the reviewer from Behindwoods quoted: "There is a small surprise with regards to Asin's role. She is the romantic interest of Ajay and looks serene and absolutely cute." The movie is now declared a superhit. Khiladi 786, in which she reunited with her Housefull 2 costar, Akshay Kumar, released on 7 December 2012 to mixed reviews, but was strong at the box office and eventually became a commercially successful venture. Asin did not appear in any movie in 2013 or 2014. Her only movie release of 2015 was All Is Well, directed by Umesh Shukla and produced by Bhushan Kumar. In one interview, director Umesh Shukla stated that Asin would be seen in an "important dramatic role". During the shoot of her film Ready in Sri Lanka, she was part of camps that were meant to help the Sri Lankan Tamil people who were affected by the Sri Lankan Civil War. "This cause is probably one of the biggest women-centric issues in our country. I support the education of six children each year, five of which are girls. I have closely worked with these children and I know that if given the opportunity, women can educate themselves much better and know what is wrong or right for them. Education is a basic right and women should not be deprived of that." Asin has been the brand ambassador for several companies and products, and has appeared in commercials for Avon, Mirinda, Colgate, Fairever, Tanishq, Big Bazaar, Parachute, Spinz talc, Lux, Amrutanjan Healthcare, and Clinic All Clear. Asin has been endorsing Mirinda soft drinks since 2004. Asin currently resides in Mumbai. She also owns an apartment in Marine Drive, Kochi and a farmhouse in Vagamon, Kerala. The actress is a polyglot. She can speak seven languages; being well-versed in Malayalam (her mother tongue), Tamil, Telugu, Sanskrit, English, Hindi and French. Asin also speaks a smattering of Italian and learnt basic Marathi for her movie Khiladi 786, in which she played a typical Marathi girl. In June 2013, it was reported in the Indian media that Asin was learning German during her free time. She began learning Spanish after visiting Spain in early 2014. Asin married Micromax co-founder Rahul Sharma in January 2016, and quit acting after the wedding. Her first child, a daughter Arin, was born on 24 October 2017. ^ a b "I am only 23: Asin". The Times of India. 21 April 2009. Retrieved 4 August 2013. ^ a b Dasgupta, Priyanka (26 October 2010). "I can't hide my age: Asin". The Times of India. Retrieved 4 August 2013. ^ a b Singh, Prashant (26 October 2012). "Asin Thottumkal has a working birthday, turns 26 on sets". Hindustan Times. Retrieved 4 August 2013. ^ "I want to work with younger actors of my generation: Asin". The Times of India. 17 February 2013. Retrieved 2 March 2013. ^ a b "Asin busy in learning German". Desimartini.com. Top Movies Entertainment Ltd. 7 June 2013. Retrieved 28 October 2014. ^ "Biography: Asin Thottumkal | Meen Curry". meencurry.com. Archived from the original on 20 February 2017. Retrieved 20 February 2017. ^ a b "Asin speaks Hindi". asinonline.com. Archived from the original on 4 October 2013. Retrieved 2 June 2013. ^ "Top 5 heroines of the year 2007: Asin easily topples all!". www.filmibeat.com. ^ "Asin`s birthday bash!". Sify. ^ "Asin & Kareena rule Bollywood`s 100 Cr club!". Sify. ^ "Kalaimamani awards presented to 70 persons". The Hindu. Chennai, India. 29 November 2009. ^ Bollywood Hungama. "Asin bags the Pride of South Indian Cinema Award - Latest Movie Features - Bollywood Hungama". bollywoodhungama.com. ^ Top Worldwide Grossers ALL TIME: 100 Crore Archived 23 May 2013 at the Wayback Machine. Box Office India (3 February 2012). Retrieved 10 July 2012. ^ "Look". The Telegraph. Calcutta, India. 14 May 2006. Retrieved 2 March 2013. ^ Asin was supposed to be named as Mary. The Times of India. (14 June 2012). Retrieved 10 July 2012. ^ Ahmed, afsana (11 May 2009). "Salman's very supportive: Asin". The Times of India. Retrieved 5 August 2009. ^ "A surprise step, an award-winning debut". The Hindu. Chennai, India. 9 March 2009. ^ "I am quite like Aamir: Asin". The Times of India. 10 November 2012. Retrieved 10 November 2012. ^ a b Thottumkal, Asin (24 December 2008). "Awards". AsinOnline.com. Retrieved 24 December 2008. ^ Radhakrishnan, Mathangi (15 October 2004). "'M. Kumaran...' rules the Tamil box office". MusicIndiaOnline. Archived from the original on 24 February 2007. Retrieved 24 December 2008. ^ Narasimhan, ML (30 December 2005). "Dubbed films rule yet again". The Hindu. Chennai, India. Retrieved 24 December 2008. ^ Shivram, Prasanna (13 July 2007). "Jeeva's lyrical frames". The Hindu. Retrieved 24 December 2008. ^ Kamath, Sudhish (1 November 2005). "Asin turns out to be the brightest sparkler this year". The Hindu. Chennai, India. Retrieved 24 December 2008. ^ "Ghajini". Sify. 27 September 2005. Retrieved 23 December 2008. ^ Rangarajan, Malathi (11 November 2005). "With the formula intact". The Hindu. Chennai, India. Retrieved 24 December 2008. ^ Ashok Kumar, SR (4 November 2005). "Where is the entertainment?". The Hindu. Retrieved 24 December 2008. ^ Rangarajan, Malathi (27 October 2006). "In the race, surely — Varalaaru". The Hindu. Chennai, India. Retrieved 24 December 2008. ^ Vardhan, Adithya (2 January 2007). "Annavaram is paisa vasool". Rediff. Retrieved 24 December 2008. ^ Mohan, Piraba (14 January 2007). "Aalwar: Ajith is the saving grace". Behindwoods. Retrieved 24 December 2008. ^ Bhaskar, Shweta (15 January 2007). "Pokkiri: Watch only for Vijay, Asin". Rediff. Retrieved 24 December 2008. ^ Hari, TSV (8 November 2007). "Vel is slick and neat". Rediff. Retrieved 24 December 2008. ^ Vijayasarathy, R. G. (13 June 2008). "Dasavathaaram is spectacular". Rediff. Retrieved 24 December 2008. ^ "Kamalhassan's new blockbuster hit is setting records worldwide". The Times. 29 June 2008. Retrieved 24 December 2008. ^ Adarsh, Taran (23 December 2008). "Review: Ghajini has blockbuster written all over it". Sify. Retrieved 23 December 2008. ^ "Top Lifetime Grossers 2000–2009 (Figures in Ind Rs)". Box-Office-India. ^ Jha, Subhash. K (10 December 2008). "Asin to croon for London Dreams". NDTV. Retrieved 24 December 2008. ^ IndiaGlitz (17 January 2009). "Asin's encore with Kamal Hassan". IndiaGlitz. Retrieved 17 January 2009. ^ "Vijay's Kaavalan is a hit!". Sify. Retrieved 26 January 2011. ^ "Vijay (re)turns romantic! Feel good – Feel emotional". Behindwoods. Retrieved 23 March 2011. ^ "Box Office: Ready opens to good opening with mixed response". ibosnetwork. Archived from the original on 10 July 2012. Retrieved 4 June 2011. ^ "Ready Movie Review". Behindwoods. Retrieved 5 June 2011. ^ "Ready is second to Dabangg". The Times of India. 7 June 2011. Retrieved 7 June 2011. ^ "Housefull 2 gets average reviews from film critics". Retrieved 1 April 2013. ^ "Top Ten 2012 Lifetime Grossers". Box Office India. Archived from the original on 2 November 2012. Retrieved 1 April 2013. ^ Adarsh, Taran. "Housefull 2 Movie Review (2012)". Bollywood Hungama. Retrieved 1 April 2013. ^ Bol Bachchan (2012) | Hindi Movie Critic Review By Taran Adarsh. Bollywood Hungama. Retrieved 10 July 2012. ^ Bol Bachchan Review. Behindwoods.com. Retrieved 10 July 2012. ^ Bharti Dubey (13 July 2012). "Bol Bachchan's business going strong at box office". The Times of India. Retrieved 26 October 2012. ^ BO Report: Akshay Kumar's Khiladi 786 passes the test Archived 20 December 2012 at the Wayback Machine. Hindustan Times (11 December 2012). Retrieved 11 June 2013. ^ "Asin to romance Abhishek Bachchan in Mere Apne". The Indian Express. 8 August 2013. Retrieved 19 October 2014. 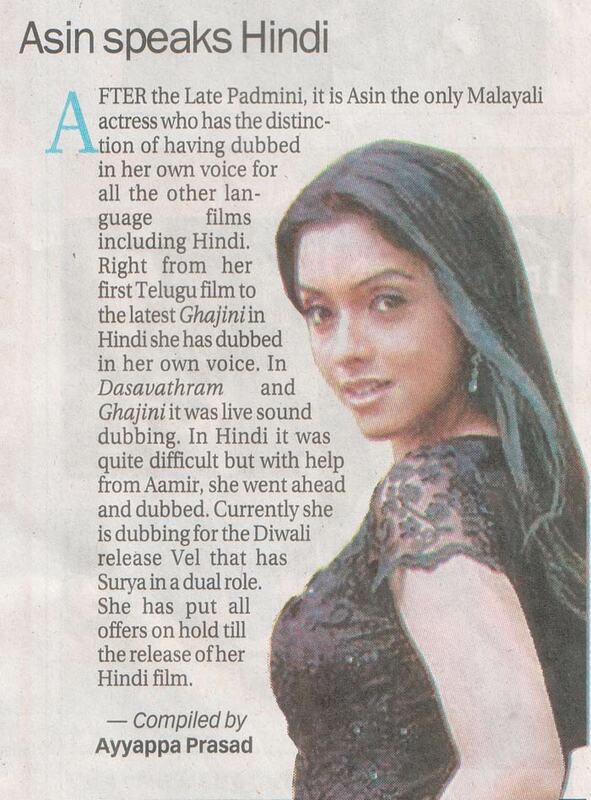 ^ "Asin wins hearts in Sri Lanka — Times of India". The Times of India. 13 July 2010. Retrieved 23 March 2011. ^ Health is of utmost importance, says Asin. DNA (20 February 2012). Retrieved 10 July 2012. ^ "Avon signs Asin as brand ambassador in India". The Times Of India. 3 February 2014. ^ a b c "'I'm a people's person'". The Indian Express. 24 May 2009. Retrieved 16 August 2013. ^ "CavinKare to focus on non-South markets". Business Line. 11 May 2010. Retrieved 16 August 2013. ^ Rachel Fernandes (22 May 2009). "Asin endorses Big Bazaar - Times of India". The Times of India. Retrieved 16 August 2013. ^ a b "Aamir's find: Asin - Entertainment - DNA". Daily News and Analysis. Retrieved 16 August 2013. ^ "Asin Thottumkal to endorse new Lux soap". Sify.com. 17 September 2010. Retrieved 16 August 2013. ^ "Amrutanjan in talks to buy beverages co". Business Line. 13 September 2010. Retrieved 16 August 2013. ^ "Bollywood Divas say no... - Times of India". The Times of India. 18 June 2009. Retrieved 16 August 2013. ^ Tripathy, Nandini D. (20 February 2014). "Quick Five: Asin - Qualitative visibility". The Hindu. Chennai, India. ^ Mehul S Thakkar (5 August 2012). "Prabhudheva is Asin's new neighbour". The Times of India. Retrieved 26 October 2012. ^ "Birthday girl Asin gifts herself a plush 6-room home – Entertainment – DNA". Daily News and Analysis. 26 October 2011. Retrieved 26 October 2012. ^ "Asin – The cool chameleon!". Sify.com. 2 November 2011. Retrieved 26 October 2012. ^ "Birthday girl Asin gifts herself a plush apartment". daily.bhaskar.com. 26 October 2011. Retrieved 26 October 2012. ^ "Asin's summer getaway is her quaint farmhouse in Vagamon - The Times of India". The Times Of India. ^ "Asin's 'little piece of heaven' down south". indiaglitz.com. ^ "Asin's Jack of all and master of one". Asianage. 3 November 2012. Archived from the original on 8 January 2018. Retrieved 3 November 2012. ^ a b "Asin Thottumkal knows seven languages!". dna. ^ DC chennai (27 August 2012). "Asin learns Marathi". Deccan Chronicle. Retrieved 26 October 2012. ^ "Asin learning Spanish". intoday.in. ^ "Asin Marries Rahul Sharma". Retrieved 20 January 2016. ^ "Asin quits acting after marriage: Other actresses who chose family over career". Daily News & Analysis. 6 April 2016. Retrieved 2 May 2016. ^ "Asin And Rahul Sharma Share First Pictures And Name Of Their Daughter On Her First Birthday". MSN. 26 October 2018. Retrieved 26 October 2018. ^ "Narendran Makan Jayakanthan Vaka - Malayalam Movie Reviews, Trailers, Wallpapers, Photos, Cast & Crew, Story & Synopsis - Filmibeat". FilmiBeat. ^ "Amma Nanna O Tamila Ammayi". FilmiBeat. ^ "M. Kumaran Son Of Mahalakshmi". FilmiBeat. ^ "Ullam Ketkume - Tamil Movie Reviews, Trailers, Wallpapers, Photos, Cast & Crew, Story & Synopsis - Filmibeat". FilmiBeat. ^ "Chakram - Telugu Movie Reviews, Trailers, Wallpapers, Photos, Cast & Crew, Story & Synopsis - Filmibeat". FilmiBeat. ^ "Sivakasi - Tamil Movie Reviews, Trailers, Wallpapers, Photos, Cast & Crew, Story & Synopsis - Filmibeat". FilmiBeat. ^ "Annavaram - Telugu Movie Reviews, Trailers, Wallpapers, Photos, Cast & Crew, Story & Synopsis - Filmibeat". FilmiBeat. ^ "Varalaru - Tamil Movie Reviews, Trailers, Wallpapers, Photos, Cast & Crew, Story & Synopsis - Filmibeat". FilmiBeat. ^ a b "Vel". FilmiBeat. ^ "Dasavatharam - Telugu Movie Reviews, Trailers, Wallpapers, Photos, Cast & Crew, Story & Synopsis - Filmibeat". FilmiBeat. ^ "Ghajini (2008)". Bollywood Hungama. Retrieved 18 May 2014. ^ "London Dreams (2009)". Bollywood Hungama. Retrieved 18 May 2014. ^ "Kavalan - Movie Reviews, Kavalan vijay, kavalan review, kavalan movie review Kavalan vijay, Kavalan stills, Wallpapers, Photos, on popcorn.oneindia.in". FilmiBeat. ^ "Ready (2011)". Bollywood Hungama. Retrieved 18 May 2014. ^ "Housefull 2 (2012)". Bollywood Hungama. Retrieved 18 May 2014. ^ "Bol Bachchan (2012)". Bollywood Hungama. Retrieved 18 May 2014. ^ "Khiladi 786 (2012)". Bollywood Hungama. Retrieved 18 May 2014. ^ "All Is Well (2014)". Bollywood Hungama. Retrieved 18 May 2014. Wikimedia Commons has media related to Asin (actress).